A remote control helicopter makes a great gift for children of all ages. Even parents will love teaching their child how to use their new toy. A helicopter is ideal for kids who have everything – it’s different from any other toy and is relatively inexpensive. It will also give a child years of enjoyment – they won’t be quick to outgrow it and cast it aside. There is a lot of choice on the market, some with basic features for younger children and some more advanced models for those looking to improve their skills and have even more fun. Here, we have chosen nine of the best remote control helicopters available and highlighted their key features to help you make the best choice for your kids. There’s a lot to think about when it comes to choosing the perfect RC helicopter for your child. You’ll need to consider their ability to ensure you don’t choose something which is too difficult for them to operate. You also need to think about where your child will be using the helicopter. Make sure it has a large enough range for where it will be used. You should also think about what features you would like the product to have. Some are more basic and aimed at younger children. Others have more advanced specs and would better suit an older child or teenager. Also consider whether a helicopter is the right choice of remote control toy for your child. For those who have never had an RC toy, it might be easier to start with a car. If you have access to a pool or lagoon, a remote control boat can be a great choice. Why not check out our reviews of other remote control toys for kids? This is the ideal mini RC helicopter for beginners – it’s easy to fly and low-cost. It’s perfect for all ages from young kids right up to adults – it’s easy enough for youngsters to learn whilst still being fun enough for teens and adults to enjoy. It’s suitable for indoor use only as it is very lightweight, at around 35g. The battery is included and will last well on a single charge, giving you more flight time. It’s quick to charge too, taking only half an hour, so you don’t have to wait to get flying. 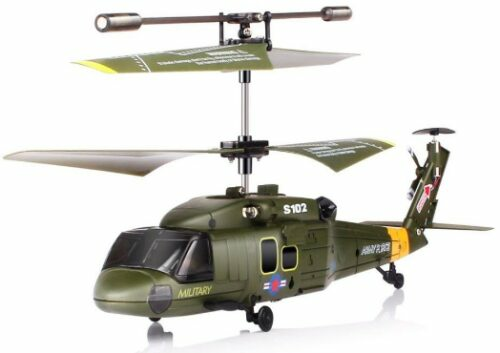 For those who wish to play with family and friends, this Syma helicopter toy is perfect. It has three channels, so you can play together. It’s also available in other colors so you can easily find your helicopter when they’re in the air. This is the ideal RC helicopter for indoor or outdoor use. It has a gyro stabilizer to make flying easier, and can travel in all directions including backwards and hovering. It is larger than some other helicopter toys, at around 10 inches long. The G610 is the perfect remote flying toy for kids aged around eight and older. It has a range of 15 meters and can fly for just under 10 minutes. Charging takes place and takes up to 50 minutes, which is slightly longer than some other models. It requires a bit of assembly before use, and be sure to check the instructions to learn how to fly it. You’ll also need six AA batteries for the remote, but these can also be used to charge up the helicopter. This fun helicopter toy is perfect for younger children. It is easier to operate than a traditional RC helicopter – it is controlled by the users’ hand movement. Place your hand under the ball and it continuously works to detect your hand movement. It has fun features sure to please young children such as color changing LED lights – fantastic to use at night. The ball is solid and hard to break, so don’t worry if you find it difficult to control at first. It has a great battery life – takes only 20 minutes to charge before giving you up to 15 minutes flight time. This RC flying toy would make the perfect gift for any child – it will provide years of fun and at an excellent price. This little helicopter toy is the perfect choice for pre-schoolers who long to fly! It’s really easy for youngsters to control thanks to its super simple remote. Even the youngest toddlers will love to play with this helicopter toy – it takes off, turns and lands all at the press of one button. It also hovers automatically, meaning little ones can watch in amazement without having to work to keep it airborne. The Little Tikes helicopter is sure to delight young children with its LED lights and fun sound effects. It is made of solid plastic meaning it can stand up to some rough play from curious toddlers. The propellers are protected by a plastic ring to ensure they don’t get caught up in anything, for added safety. It requires six AA batteries, so you may wish to add some rechargeable batteries to your shopping list too. This is a great-looking kids helicopter is for younger children who are looking for their first ‘proper’ helicopter toy. The realistic design and fun features are sure to please adults too. The features aren’t as impressive as other products here, but it flies well and comes at a bargain price. The small size means it’s perfect for indoor use, and it also has a small light so it can be used at night. The range is around eight meters, and flight time is up to eight minutes. Charging takes around 40 minutes, via USB or the controller. If the helicopter becomes damaged, spare parts are available cheaply so don’t worry too much if your child has never had a helicopter toy before. This eye-catching helicopter has an impressive range of up to 50 feet. It has three frequencies so you can play together with a group of friends for more fun. It’s easy to use for beginners thanks to its in-built gyro. The controller is simple enough for kids as young as six to master. It’s also tough and can withstand a few bumps and crashes – perfect for beginners. It’s ideal for indoor or outdoor use and has great maneuvrability. There are bright lights for flying in the dark – kids of all ages will love watching this! The flight time of this flying helicopter toy is unfortunately rather short at six minutes. However, it doesn’t take long to recharge so you can be flying again in no time. This large RC flying helicopter is perfect for those looking for something a bit more advanced. The stylish camo design is sure to appeal to both little kids and adults. The polymer body can withstand up to 200 pounds of force, making it perfect for use in places where it may take a hard hit. The larger size and weight of this copter means it can easily be used outdoors without the risk of breaking or losing it. It comes fully assembled and ready to fly straight from the box. It has a wall charger, and the remote requires 6 AA batteries, which are not included. The remote is simple to use, so younger kids will quickly be able to learn how to fly this helicopter. 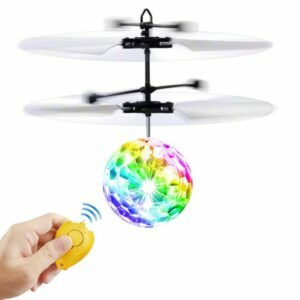 The Air Hogs heli toy is perfect for those with more experience of remote control flying toys. It comes with spare tail rotors in the case of accidents. It’s made of crash-proof materials, meaning you can practice you skills without the risk of breaking the toy. The maximum height on this helicopter is up to 50 feet, making it perfect to use in large open areas. It has dual propellers and an internal gyroscope for stability – this is a top-spec RC copter. The attractive design is sure to appeal to older kids and teens, and adults will also love showing their kids how to fly the helicopter. It’s recommended for ages 10 and above, but younger kids could learn how to fly it with help. full charge will give you up to 12 minutes in the air. The helicopter can be used outdoors, but only in low wind due to its lightweight. The range is around 30 feet, so be careful not to let it get too far away. It also has flashing lights, meaning it can be used at night too for even more fun. There are two frequencies, and two colors available, meaning you can play together with a friend. 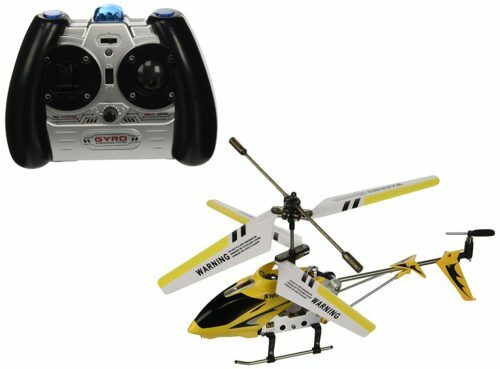 The Air Hogs 400x is a great choice for those looking for a more advanced flying helicopter toy. It has fantastic features suitable for older kids and teens. The design of this helicopter is really stylish and eye-catching – your kids’ friends will love coming over to play with their new toy. It is a bit more expensive than some of the other helis reviewed here, but for the performance it is well worth paying a bit more. Your kids will get years of use from this helicopter as it is built to last meaning you won’t have to buy them another one any time soon. 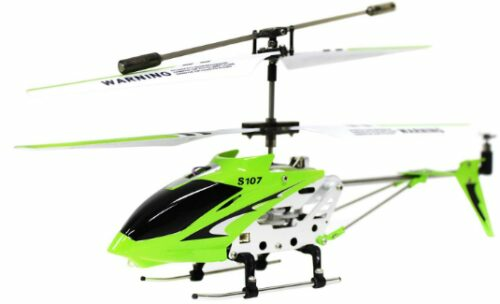 The Syma S107G is a great value first helicopter for kids and adults of all ages. It is very small and lightweight, yet still easy for beginners to handle. It is great for siblings as it can be used on two frequencies, meaning they can play together. The Syma copter is so cheap that you won’t mind paying for more than one.